We purchased a murphy bed unit from Valet and found their service from start to finish to be impeccable! We are completely satisfied with the product, the sales staff and the installers! A customer just called to rave about our installers! Some adjustments had to be made with her garage cabinets on site and the installers took care of everything seemlessly. Anna is thrilled with her new garage cabinets. We Love the Built-in Office! 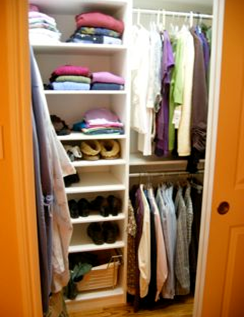 This is to let you know about the excellent job Salvatore Rodriguez did in my closets today. Sal was expert at installing the shelves, drawers, etcetera, worked efficiently, and cleaned up thoroughly when he was done. You should be proud to have him as your employee. All around, one of the best customer experiences we have had in quite some time. Jerry was a pro throughout the process, was very attentive to managing our project and so easy to deal with. He responded to all of our major and minor questions promptly and always circled around to ensure we were on the same page. "I recently bought my first home in the Hensley Historical District of San Jose. Although built in 2010, the home is styled after a 1940's bungalow, complete with deep closets and a walk-through closet (linking bedroom to bathroom) in the master bedroom, read: awkward space creating natural his/hers closets." What to Look for in a Custom Cabinet Company! Stop tripping over superfluous items that simply will not fit inside the cabinets that come with your home and have some custom cabinets built that can actually hold all of your things. 5 Star Review-Valet Custom Cabinets & Closets! "Hi, Karin! How nice to hear from you! Don and I are loving our closets; this is one of my favorite parts of the remodel. Dividing the one large closet space into two separate closets and creating two sets of sliding doors that extend the full width of the wall (so that we can access all the space) was a good move."